The scene was colorful and energetic, as thousands of music fans shifted from the three stages on the Benjamin Franklin Parkway to watch Skrillex, D'Angelo, Passion Pit, Janelle Monae, Calvin Harris and 10 other acts. Jay-Z's entrance said it all: He bounced up and down on top of the steps of the Philadelphia Museum of Art, mimicking Rocky before he took the stage in front of nearly 50,000. His song "Made In America" played in the background. Jay-Z, like Rocky Balboa, has a rags-to-riches American dream story, and the 42-year-old entertainer — who grew up in the Brooklyn projects and released his debut album in 1996 — shared some of that through songs in his 90-minute set Saturday night at the Budweiser Made In America festival. He entered from the back of the stage after running down the steps to perform "Public Service Announcement." That was followed with the night's first cameo: a prerecorded video with President Barack Obama. Obama urged the crowd to vote this fall. 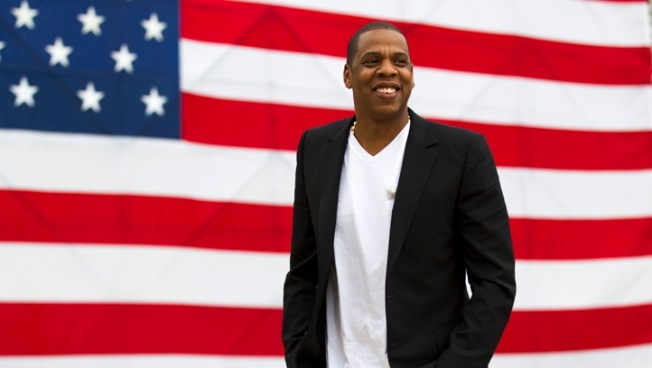 He also said Jay-Z's story is "what Made In America means" and added that he enjoys listening to the rapper's music on his iPod. Jay-Z headlined the first night of the two-day festival he curated, performing hits like "99 Problems," ''Dirt Off Your Shoulder," ''Big Pimpin'" and "Empire State of Mind." The event is the first of its kind for the entrepreneurial Jay-Z, who is married to superstar Beyonce and owns a music management company, fashion line, nightclub and restaurant; he's also a co-owner of the Brooklyn Nets. "Since you were so good to me, Philly, I'm going to be good to you tonight, Philly," Jay-Z yelled. Rappers Pusha T and Big Sean hit the stage, and Kanye West followed, receiving an electrifying roar from the crowd. They performed a medley of hits, such as "Mercy," ''Dance" and "Can't Tell Me Nothing." Jay-Z also brought out his former protégés and Philadelphians Freeway, Chris and Neff, as well as Memphis Bleek. Common, 2 Chainz and Swizz Beatz also made appearances. The scene was colorful and energetic, as thousands of music fans shifted from the three stages on the Benjamin Franklin Parkway to watch Skrillex, D'Angelo, Passion Pit, Janelle Monae, Calvin Harris and 10 other acts. Sunday's line-up includes Pearl Jam, Run DMC, Odd Future and Drake, who was in the crowd Saturday night. The festival is being filmed as a documentary and will be directed by Ron Howard. Proceeds from the ticketed event will benefit United Way chapters. Jay-Z closed the night with West, performing the smash hit "...In Paris." Then fireworks blasted.